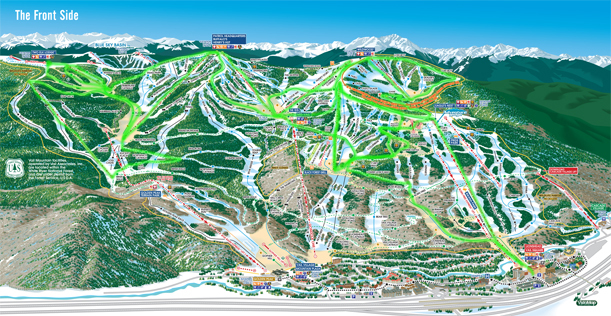 Here is an example mountain tour for the beginner level skier or snowboarder. Follow each step below over one full day or several days. The outline below will give you an enjoyable cruise as well as picturesque views of the entire frontside of the mountain. 1. For this tour, you’ll begin in Lionshead Village and take the Eagle Bahn Gondola (#19) up to Eagle’s Nest. This route will not only provide a great place to start once at the top, it also offers scenic views and gives you a bird’s eye view of the expansiveness of the mountain. 2. Once at the top, head towards Little Eagle Chair (#15). 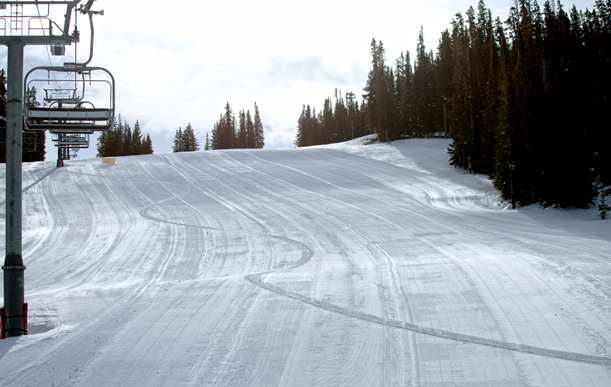 Here you have the option to ski down or to take a few practice laps on Chair #15. When you’re ready for a change of scenery, take Practice Parkway away from Chair #15. Breathtaking views from Eagle’s Nest and Little Eagle Chair (#15). 3. Follow Practice Parkway down and around until you see Ledges (as a green run). This run is wide, rolling, and offers great pockets near the edge of the trees to stop and take a breather. 4. As you follow Ledges down, the mountain will naturally roll towards the east. Follow Cub’s Way as it will guide you towards the Avanti Express (#2). Take this four person express lift to the top. 5. Once at the top, follow signs for Eagle’s Nest following Eagle’s Nest Ridge the entire way. Turn down Practice Parkway and your next run will be Minnie Ha Ha. Smooth, rolling pitches await off of Avanti Express (#2). 6. Follow Minnie Haha over to Chair #2 and take it up. Follow Eagle’s Nest Ridge down towards Game Creek Bowl via Game Trail. You are now in your first Back Bowl. 7. At the bottom of Game Trail, Game Creek Express (#7) will take you to the peak. When you reach the top, stop and have your picture taken. You will have a view of Mount Holy Cross, Game Creek Bowl, and Sun Down Bowl. 8. 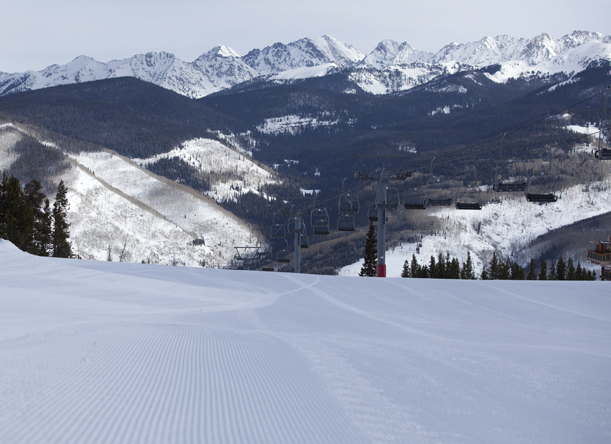 Your next run is a Vail fan favorite, Lost Boy. Follow Lost Boy signs as they lead you on a tour, traversing Game Creek Bowl. When you reach the end of the traverse, the mountain will open up and you will be free to carve wide turns on a gradual pitch. Waiting for you at the bottom you’ll find Chair #7. 9. When you reach the top of Game Creek Bowl, head to your left, towards the Wildwood Smokehouse. 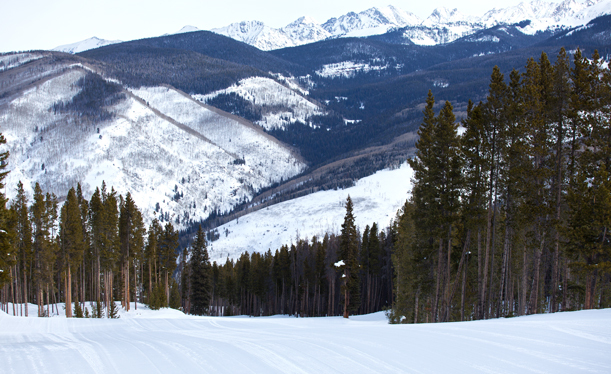 Follow The Meadows all the way down until you reach Mid-Vail and Wildwood Express (#3). 10. Take Chair #3 and you’ll likely recognize the smell of Wildwood Smokehouse as you approach the top of the lift. Again, follow The Meadows down until you see Overeasy. Overeasy is another quiet run where you can enjoy your own little slice of the mountain. 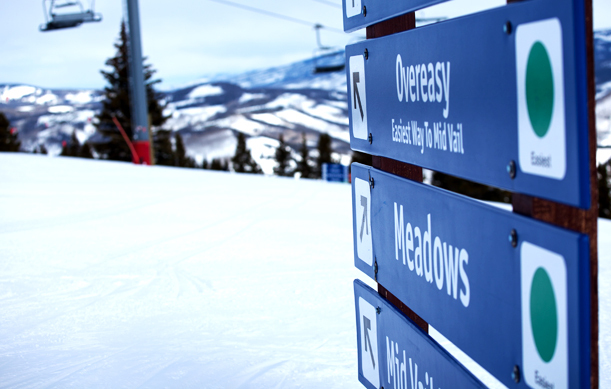 Overeasy and Meadows guide you to the center of the mountain, Mid-Vail. 11. At this point, you may be getting a little hungry. Not to worry, it’s almost lunch time. 12. Jump on the Mountain Top Express (#4) located at Mid-Vail and you’ll be headed towards a side of the mountain you have not yet seen. Once at the top of the lift, follow signs for the Timberline Catwalk. Relax and cruise until you arrive at Sourdough Express (#14). 13. Lunch time: At the top of the lift, you’ll find Two Elk Lodge beckoning you in for a break. Relax, recharge, and enjoy the view. 14. After lunch, you’ll be able to enjoy plenty of runs right outside of Two Elk Lodge. For starters, head towards Tin Pants. This run is nestled back into the woods to provide a bit of serenity but also enough space to comfortably turn. At the bottom of Tin Pants, hop on Chair #14 again and enjoy a few sunbaked laps on this lift by cruising down Boomer and then Sourdough. Make your own path just under Sourdough Express (#14). 15. Once you’ve reached the bottom of Sourdough run, pass by Chair #14 and follow Flap Jack run. You will pass by Northwoods Express (#11) and follow Northface Catwalk leading to Skid Road. 16. At the bottom of Skid Road, you will be just above Golden Peak Village but not in view. The Highline Express (#10) will be your option to go to the top. 17. At the top of Chair #10, gather your group to Follow Flap Jack down as you enjoy a more quiet side of the mountain that leads into the Northwoods area. 18. You will see Chair #11 at the bottom of Flap Jack and will take that up. Enjoy the ride as this is your final run of the day. 19. To head back into Lionshead, follow Swingsville. Swingsville will lead you to Mid-Vail, where you will find Upper Lion’s Way followed by Lower Lion’s Way. 20. As you see signs for Born Free, go ahead and take it. This is one of Vail’s classic runs and something that you’ll be more than prepared for after your successful day. You’ve covered a lot of terrain, way to go! 21. Congrats, you conquered the mountain! Now it’s time to relax and enjoy a well deserved apres ski at Tavern on the Square. Great work! Relish in the fact that you skied the entire frontside of the mountain as well as one of Vail’s legendary Back Bowls.